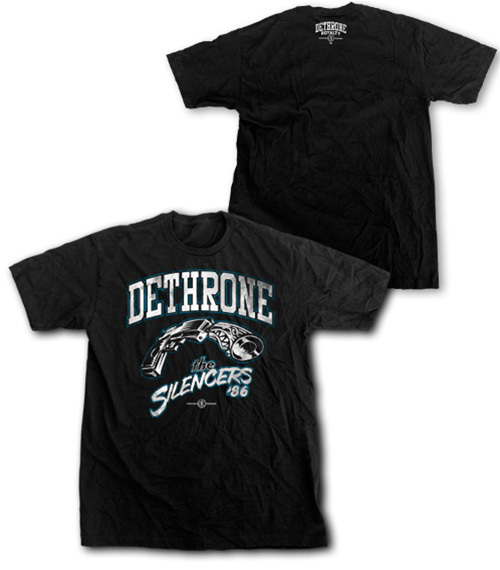 Check out the Dethrone George Sitoropolous UFC 132 Walkout Shirt! 10th Planet Jiu-Jitsu specialist George Sitoropoulos will be facing off with fellow Brazilian Black Belt Rafael Dos Anjos at UFC 132. Both coming off losses from Dennis Siver and Clay Guida respectively, which one of the two will be successful and make their way back to title contention in the lightweight division? The Dethrone George Sitoropolous UFC 132 Walkout Shirt features a 60% cotton and 40% polyester blend which makes it perfect both training and casual use, a Dethrone logo with a gun and stylized bullet, deeming the shirt’s alternative name, the Dethrone Silencer T-Shirt. This Dethrone George Sitoropolous UFC 132 Walkout Shirt is available at MMA Warehouse.